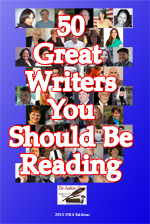 Yesterday we received our copy of 50 Great Writers You Should Be Reading, 2013-2014. 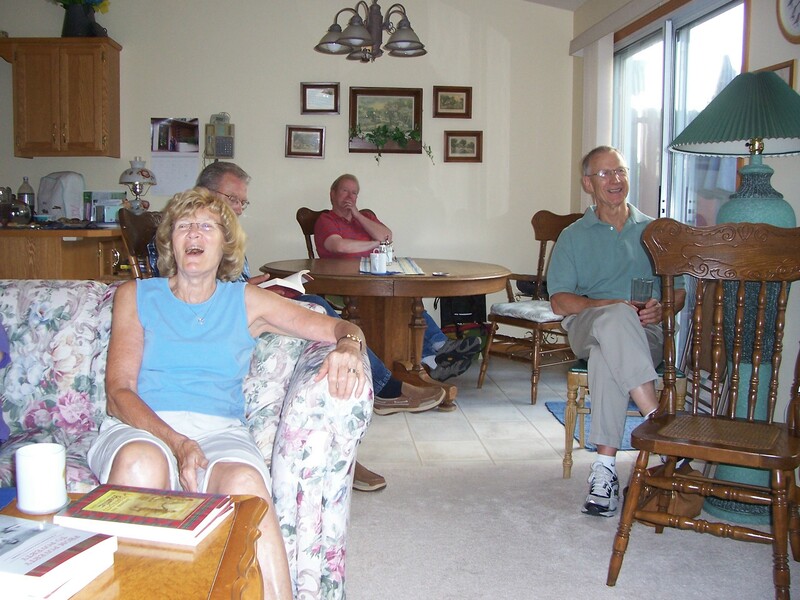 Another blogger – Kev – sent us a comment a short time ago remarking that he enjoyed some of our pictures from book readings and noted “Beautiful pic…some great laughter going on there. .
Well, those “next few days” have grown to several weeks so it is high time that I (Gayle) fulfill my promise. So here is the excerpt from Ian’s story. 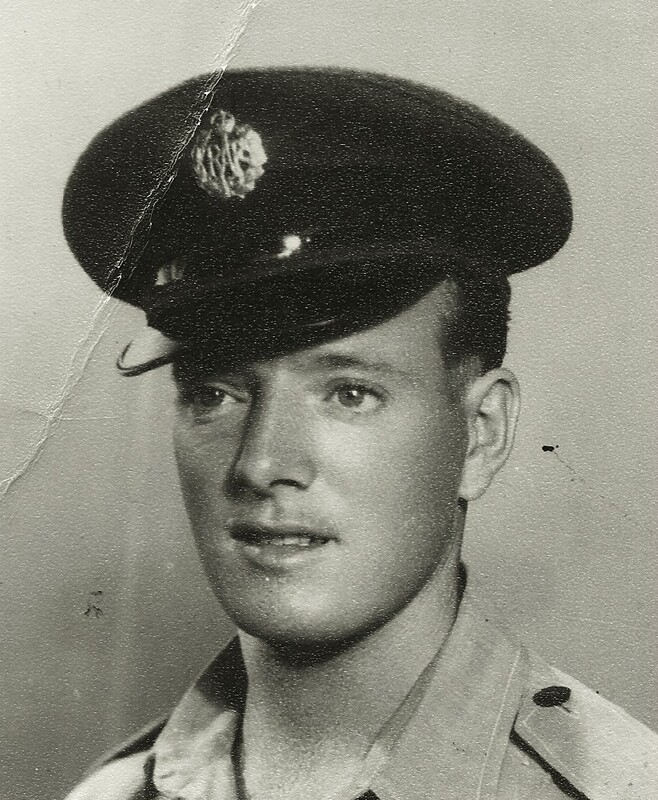 Airman Ian Morrans, Royal Air Force, 1951, RAF photo. To set the scene, the year is 1950. Eighteen-year-old Ian has just completed his “square bashing” (basic training) with the Royal Air Force in southern England and tells of his disastrous first leave home to Campbeltown in southwest Scotland. I arrived at our house in Campbeltown at 9:30 in the evening after being on trains or waiting for connections in train stations for a total time of about 20 hours. I found two of my mother’s Salvation Army lady friends visiting her, the three of them huddled around a roaring coal fire. My Irish stepfather Bill was not of the Salvation Army persuasion! Very often in the years since he’d married my mother, he’d told stories of how he and his buddies would go up into the hills at Antrim and make poteen, the Irish equivalent of “moonshine” or home brew. Even then I had no idea that it was close to 100% alcohol! I had heard him remark that he was going to make some “one of these days.” I’d heard it so often that I was sick and tired of hearing it, as well as many other of his stories of this, that and the next thing that might or might not have been true. Well, when my mother said that Bill was making poteen, I couldn’t believe it. I thought he was doing his usual bragging with no truth to it—and that wouldn’t have been unusual! Because it looked so much like water, I had had no hesitation in drinking it. Remember, I was not accustomed to alcoholic drinks of any kind. I didn’t know at the time that I was drinking pure alcohol! There was about an ounce left for Bill after all his hard work. It had taken him two days to distill that small amount. Shortly after this I started feeling a bit woozy, especially as I had virtually an empty stomach. A little while later I said “goodnight” to everyone and took myself off to bed. Stumbling to my room, I stripped off, hopped into bed completely naked and was asleep almost immediately. “You mean that Ah came through here, sleep-walking, stark naked, in front of Mrs. Campbell and Mrs. MacGregor? Me with no clothes on?” I was horrified! To add to my embarrassment was the fact that both of Mother’s visitors were strict Salvation Army believers. I realized that what they thought about my imbibing—my getting fully pissed—well, that was certainly somewhere above the forgiveness level. By then I must have been the talk of the town! Even a long time later, whenever I was home on leave and I saw either of those women on the street and heading my way, I would cross over to the other side—just a wee bit more than slightly embarrassed! Strangely, no one but Mother ever mentioned the incident to me. — quoted from “From Poverty To Poverty: A Scotsman Encounters Canada,” p. 96-98, copyright © 2012, Ian Moore-Morrans. This entry was posted in author interview, autobiographical story, awards, Blogging, Life, memoir, The Authors Show, Writing and tagged 50 great books you should be reading, Campbeltown, family, humor, Laughter, Royal Air Force, Salvation Army. Bookmark the permalink. shared across the net. Shame on the search engines for not positioning this post higher!